JFW presents a new line of programmable, Ethernet-controlled attenuator assemblies. These RF attenuation systems are available in frequencies as low as 30 MHz or up to 6 GHz, in 95 dB, 63 dB, or 127 dB of dynamic range (in 1 dB steps), and with SMA or N connectors. 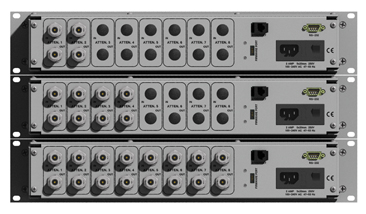 They are housed in 19” rack mountable enclosures, and have 50 Ohms of impedance. All models are guaranteed to be shipped within four weeks or less! For more specifications and features for each model, download the available datasheets and drawings.